Large video file size can drive you nuts when sending attachments over email. Here are some scenarios you might be familiar with. > Whenever I send videos as attachments in an email, I experience slow uploads. Any suggestions? > I'm running Sierra on my Macbook Air and zipped a footage of trip through Europe that is about 50Mb with the Achieve Utility. But the iCloud Mail always tells me the file is too large when I send it as an attachment. Is there a video size limit? Should I compress video before emailing it. Shrinking video will help you get around the large video size and slow upload issues with sending video in email. The guide will help you fast compress video for email, say, iCloud Mail, Gmail, Hotmail, OutLook, Yahoo Mail, etc. Apart from the video size reduction for faster emailing, video format will be changed so that email receiver can play the video file in the right format. Resize 4K/1080p/720p videos in any format to smaller MP4, FLV, WMV for email successfully, without compromising quality loss. Video compressing speed reaches to No.1, powered by Intel QSV/Nvidia CUDA/NVENC HW acceleration. Do You Know the File-Size Caps on Mail Services? The biggest grumble about email is that there is file size limit imposed by each mail provider. The maximum video size for emailing via Gmail and Yahoo is 25MB. Apple Mail and Outlook let you attach and send a video file that is no bigger than 20Mb. Certainly, you can extend your video file size limit to up to 10 Gb by relying on Mail Drop, Google Drive, Dropbox. But things seem to get even worse as the time it takes to upload or download the video attachment is so long. While zip programs such as WinZip, WinRar, Archive Utility, though allowing you to shrink video by zipping the video file, slow down computer when working with 3 or more videos at the same time. Here is a favorable turn. You can compress video for email to minimize the problems. But how to compress video size for email with no quality loss to much smaller file size and format email services accept? Follow the ways below. MacX Video Converter Pro enables you to reduce large videos, especially the 4K and HD videos that excessively extends the email attachment limits, in ways of compressing 4K UHD to 1080p, FHD 1080p to 720p, converting in MKV, HEVC, H.264, M2TS, etc to smaller-sized video format like FLV, WMV, AVI, and shrinking video via parameter adjusting , including bitrate, frame rate, etc. What's more, you can use the video editing feature, e.g., to cut out unwanted video clips (reduce video length); crop the edges of videos (shrink the video frame size) for email with smaller attachment size. Needless to worry about the video quality because High Quality Engine guarantees an untouched video quality for you guys. The best part is MacX uniquely supports level-3 hardware acceleration, powered by Intel QSV, Nvidia CUDA/NVENC, and AMD, to dramatically enhance the video processing speed, especially the 4K/8K UHD that asks for high demand on computer hardware. This greatly shorten the processing time, up to 5x faster than others. 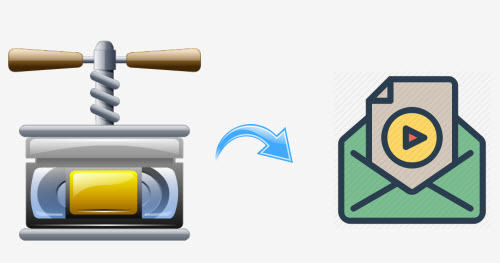 You can follow the steps to learn how to compress video files you email accept. Step 1: Free download the video reducer for email on your PC (including Windows 10), or Mac version (macOS Mojave supported) and fire it off. Click "Add File" icon to load the video file. Step 2: Choose the video format that your email service acccepts from the drop-up menu. There are over 400 readymade profiles that are preconfigured to downsize video that is perfectly sized for your device screen or so. You are also allowed to resize video for YouTube, Facebook, Vimeo, Dailymotion, Instagram, Whatsapp, and more without losing video quality. Except for the video size limits, providers also specify the video format for each email service in such a way transferring and attaching videos will be more efficient. Here is the most welcomed video format. * MP4: It features the widest compatibility and keeps a good balance between video size and quality. It is supported by both Mac and Windows platforms and playable on almost all media players, smartphones, tablets, gaming systems, tvs, etc. 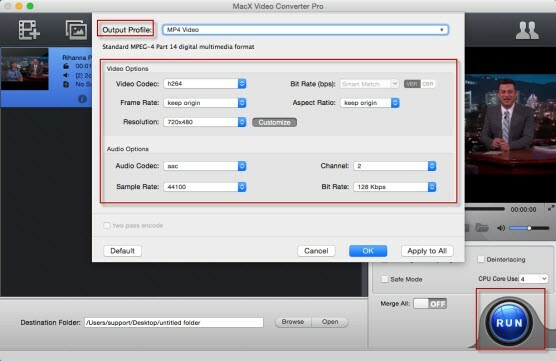 MP4 manages to output video in a smaller size but the video quality isn't degraded too much. If you wanna compress video formatted MKV, FLV, WMV, MTS etc. for email, select "MP4 Video" from the "Output Profile" drop-up menu. This is the premium choice to send video over email. Step 3: Hit Settings icon on the right, where you are allowed to adjust video parameters to decrease video size for email. It works to lower the frame rate, bitrate, resolution, sample rate, and more. * For Frame rate: Retain the frame rate unchanged in order to make sure the video playback goes smooth. Or else, mosaic appears. * For Resolution: Lower the resolution, e.g. downscale 4K UHD to 1080p or 1080p or 720p, in such a way to compress video for Email. * For bitrate: Please DO NOT decrease the bitrate too much. Video quality will be dramatically degraded along with the bitrate. Properly, 20-50% bitrate reduction can ensure a good video size shrinking with a high level of quality your eyes won't make any distinguish. Optionally, you can choose "Edit" button to reduce large video size for email by trimming, cutting and cropping the video. This won't make any video quality change but is a good way to reduce video size for sending to email. You are allowed to add SRT subtitles and watermark to specialize your video for email. Step 4: Hit "Browse" to save output video and click "RUN" button to start video compression process for email. There are many online video compressor that facilitate you to make video much smaller for email freely without even downloading a software. Among them, Clipchamp is a nice choice. It has fantastic interface and it is very easy to use. It changes video to MP4, WebM (VP9/VP8), FLV and more formats and decrease video to lower resolution for email. It works best on Chrome to reduce large video file size for email. Users are allowed to compress video and upload it to YouTube, Vimeo, Facebook or save to Google Drive at one stroke. But sometimes it takes a long time to compress a video file for emailing. 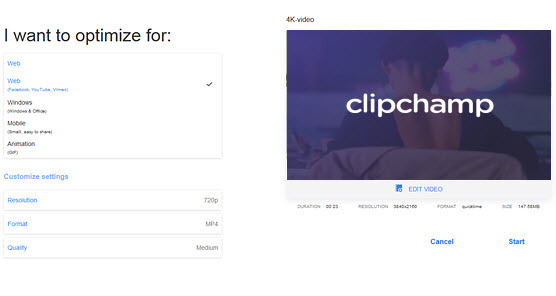 Step 1: Open the site clipchamp.com and click "Convert my video" to drop one or more video files you wanna compress from your local drive. It enables you to select any video without any limit on video size, resolution or length. After the loading, video infomation will be shown on the right side. Step 2: Adjust output settings. To downsize video for email, it is workable to set the profile for either web, windows, mobile or animation, change video format, lower the video resolution, and choose the quality. Step 3: Hit "Start" button to begin compressing large video to email. Or you can record video right now and edit it with the app to further reduce video for faster sending email. Video Compressor helps users reduce large file size for sending email on iPhone iPad iPod by trimming video and changing FHD to 720p resolution. A new video folder is created automatically, so users won’t mix it up with the original video file. But the app only compresses video in 720p VGA low resolution for emailing. You can download the app on iTunes store for free. The app gives you opportunities to resize video to send in email on Samsung, HTC and more Android mobile devices with ease. The App accepts videos in MP4, 3GP and AVI, which means that users can only decrease video size for email in these three formats. Also, it supports you to share the compressed zipped video file for email on Gmail on Android directly. It is free. However, there are too many pop-up ads. It takes along time and the output video resolution is a bit low. Anyway, app delivers poorer performance than others for email did. File Size Is Too Large to Share on Instagram. How to Compress the Video? Instagram only allows to share video no bigger than 4Gb and shorter than 1 min. You can follow the guide to shrink the video with every parameters well set for Instagram. Here recommends 4 ways to reduce and resize video of 720p, 1080p HD, 4K Ultra HD, MKV, MP4, AVCHD, AVI, MTS, etc. and adjust aspect ratio from 16:9 to 4:3, change video resolution (4K to 1080p, 1080p to 720p), bit rate and more. MacX Video Converter Pro offers you the simple yet all-round way to compress and reduce MP4 file size to AVI, FLV, WMV and more smaller-sized formats. Also losslessly downsize MP4 file size with parameter adjustment and video editing features.